In expectation of a windfall! Categories: Children, family, Love, Mother, notions, Quest, Rambles, verse, Wishes | Tags: Children, Faith, family, Love, Mother, notions, Quest, Rambles, verse, verse?, Wishes | Permalink. 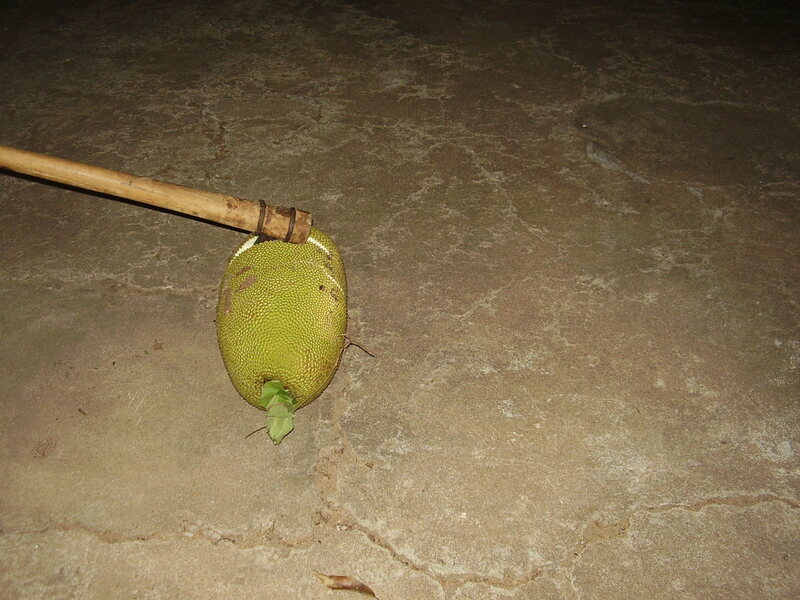 തനി തങ്കം. Thani Thankam. No, no, this is not a piece on the Grand Shopping Festival of Kerala, and it’s myriad Jewellery Stores! It’s about two special people, and their special Golden Moment. This phrase in Malayalam best describes them. Pure as gold. The kind that is tested by the hottest fires, and still holds the golden sheen, soft and malleable. Daddy and Mummy. And this day, 7th December, they celebrate 50 years of togetherness. A golden moment, is it not? And he? Well. 🙂 I loved the thick curly mane that rose from his high, broad, intelligent forehead, the quiet eyes, the hint of a smile hovering, but not quite showing itself, the reserve that used to be there (now in shambles, ever since the advent of the first grandchild 🙂 – happens to all the taciturn men, doesn’t it? 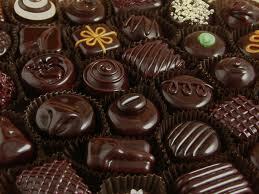 And that is just such a joy to see too!) Over the years, the hair has thinned and quite disappeared, most of it… from the top of his head, but he’s still my dashing daddy, especially when he dresses up – impeccably as always- be it is mundu- veshti or his format attire. He’s always been a stickler for time, and perfect turnouts, and still is. Dapper, even now 🙂 He is (I ought to say was, for he no longer is 😀) the reserved one. A natural reserve that drew a natural respect from all who knew him. A most sincere and committed Professional, be it while he was in the Navy, the BEL, Tata Telecom or Tata Elixsi – he inspired and continues, even now, to inspire the young… At the young age of 70, he mastered the use of a computer, and is now quite internet savvy too, lately having joined facebook as well! Mom went for classes too, and got the hang of it, but felt that virtual world was not as warm as the real world :), though skype wowed her, and FB sometimes facinates her. She’d rather interact personally 🙂 Wise girl! Together? Just as beautiful, even now, as they were then 🙂 They rock! \m/ !!! Growing up , as with other kids, there were some moments of reserve, with dad, of sheer and unadulterated fun with mom, and her large brood of siblings (dad was an only child!). There are no words to describe our parents, are there? To each of us, they hold that special something, that no other parent in the world does; and you cannot really put it in so many words. It’s the lasting ideals in life, the enduring of their spirit, the knowing ( now, especially, when one is a parent), that they did a darned fantastic job with their kids, kept them grounded (sometimes, for real too!!! ), kept teaching, with their lives, even the next generation, in fact a whole generation of their children’s and grandkids’ friends too, that makes my parents a world apart. I cannot ever say my children might someday say this of me, but this I know, my brothers and I, for sure, feel this. 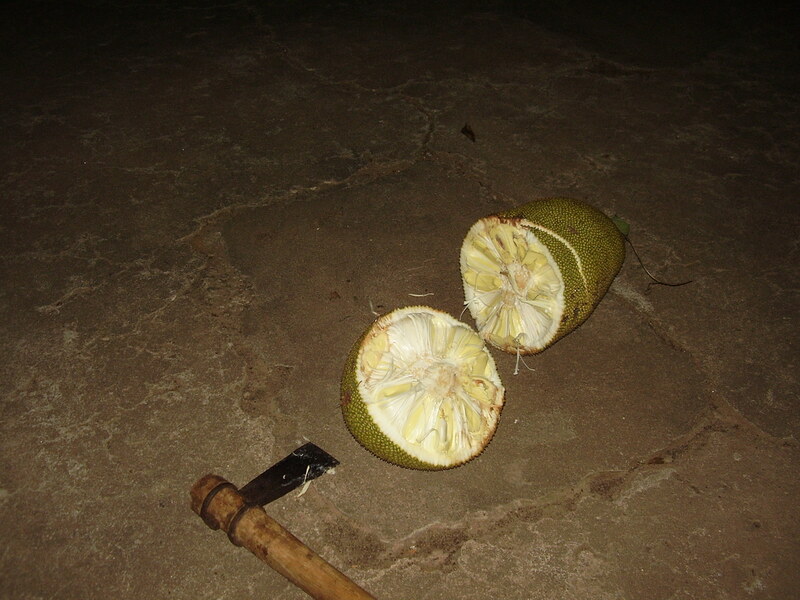 No matter what sourest of lemons life threw at them, they had the gumption to toast a tequila with it, bottoms up! They have endured, and in a way that is exemplary. Today their quiet celebration is with Lord Krishna at Guruvayoor, and some close family members… partaking of the Lord’s simple meal, and spending time in harmony with their inner selves. Another golden moment in their lives glides by. My simple wish is that they continue fill each other’s lives and ours too, with the wealth of their love, their affection and their blessing. For as long as they can, happily and in good health. For they deserve nothing less. First, they say, you have to deserve, then desire. I don’t think they would desire much more, than to see all of us happy, healthy and together… and I hope their desires, all thoroughly deserved will be theirs. As we are too. Ever. Daddy, and Mummy, a wonderful and happy anniversary to both of you! May the Lord Bless us to have you with us, hale and hearty, for a long time! Pssst… there is another one for them on A Quest, my other blog called “Golden”, if you have the time, inclination and energy after reading till here! Categories: celebration, family, Golden Anniversary, Parents | Tags: celebration, family, Father, Golden Anniversary, Mother, Parents, Wishes | Permalink. God Bless! Hope you have a great day! And year! And the rest of your life! When daughters are born, Goddess Lakshmi walks into our abode, they say. I have always believed that. I have always wanted to have a daughter that I could pamper, and befriend, and grow up with. In fact, when my second born finally made it out to the world, I told my doctor he had it wrong, when he told me it was a boy! Well. 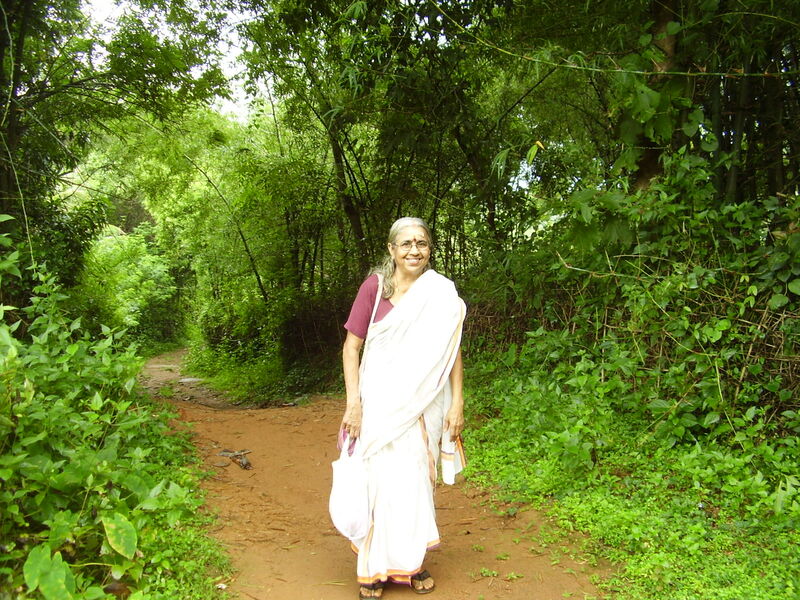 18th January, 2009, she visited a post here, and wrote, :“From one teacher to another…..:)”… and that brought me to her space, and how could I not, and how could she not? Connect. Just that… It goes beyond just being in the same profession; it is a clairvoyance of thought, of emotion, of certain likes, certain notions. You know, the feeling that one is just catching up with a person one has known for a long long long time? That is how it was with this gurl. It is like that sometimes, the knowing. The gifting of the self. The sharing that is just so clairvoyant. And so it has been with this beautiful person, whom we all know as Indyeah. Meggie my dear 🙂 Congratulations to you and PM :D! And may the Gods Bless you and yours, and keep you ever in Their Loving Grace! Categories: Blog Tradition, Children, family, Indyeah, Love | Tags: "Teacher" tattle, beginning, Blog Tradition, cherish, Children, Daughter, family, For Love, Indyeah, Love, Mother, Wishes | Permalink. My SB said to me the other day, amma, you know we’ve been together the last almost 22 years, and it’s going to be difficult na, when I go? I mean, you’ve known me only a part of your life, but I’ve known you all my life! 😆 Understatement, isn’t it? Of course he was just rehashing an old cliché!! But that is the point I’m trying to make. All our lives, we know one person the mostest, I think, our mother, sometimes, more than our father. In India at least :D! And so it is with Mom. 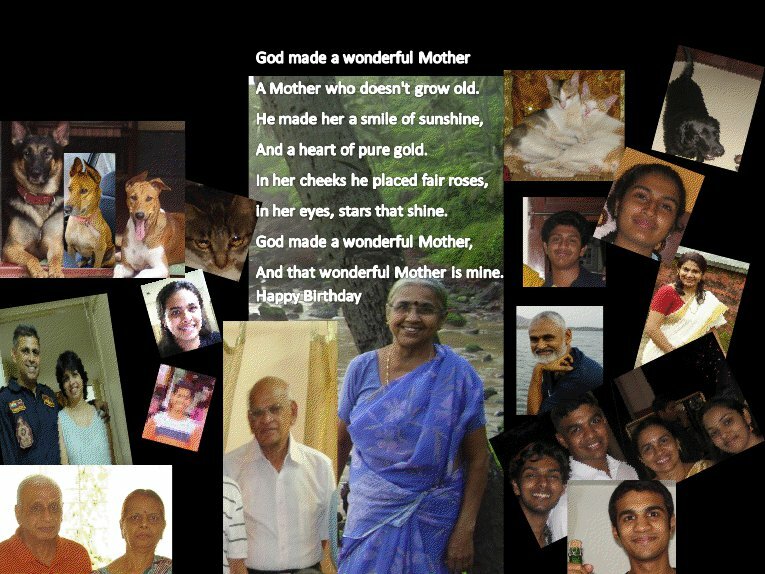 Yes, I call her Mummy, Mom, Maaaaa… somehow never got around to calling her Amma, though my kids call me that. On my insistence! 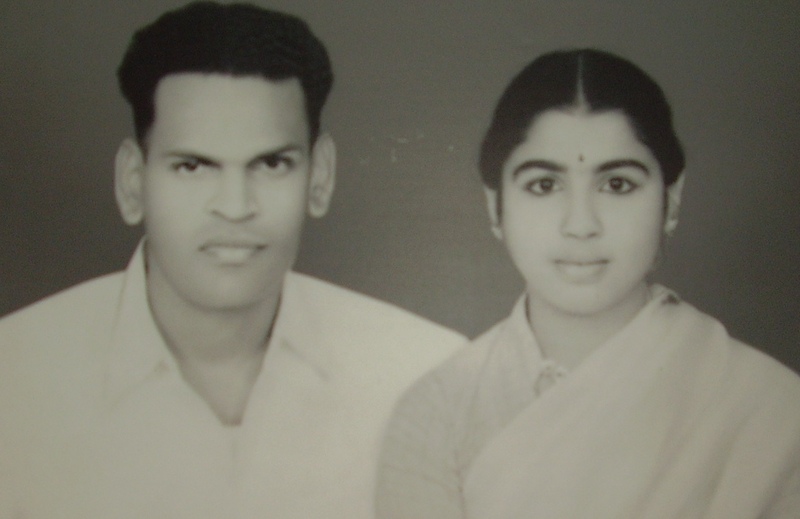 My paternal grandma, at her insistence, was called Amma by my brothers and I. That is another story for another rainy-no-muse day :)! Mom has been the strongest pillar of our family. Not just us, but even hers, I sometimes think. She takes after her own mother, who I have already described in “A Woman Extraordinaire”, with a zest for life, and an unconditional and uninhibited go-for-it attitude to life. She, like me, is the ham of a club sandwich, the 5th of 10 children her parents had. 11 if you were to count the oldest, a half brother. Life was tough as they grew, she and her siblings; lots of ancestral property managed by the Kaarnavar, or the eldest Maternal Uncle, the head of the family, entirely matriarchal… a childhood of getting, not much at all, just enough to live, dreaming of things, rushing about doing a 100 jobs around the place, along with the others. Going to school, walking over 3 miles up, then down again; taking turns to carry the large tiffin carrier; being denied further studies after her 10th, which only she and her youngest sister passed, because she had been seen, approved and was to be married off!! Tough times. Times that could, I have felt, crushed one with a weaker spirit. So almost 50 years ago, she got married, a charming 17 year old, to a handsome tall dashing young navy man. My Dad. Though there are times we, both mom n I, rave and rant about men, I have always felt she was lucky, way luckier than her sisters, cousins, relatives, heck, even me :P! But then, I am biased am I not? She got married to my .. MY dad :D! Tougher times ahead, unfortunately! Being the wife of an only son has its problems. A possessive mother in law, who, though never abusive or hurtful, was possessive enough to make things difficult! But, yet again, she was lucky in that she was able to join Dad and travel with him on his various postings. And then of course, she had us 🙂 🙂 🙂 Lucky her! Lol! With just a year between my EB and me, it was difficult for her to manage us, especially with Dad off sailing for long periods. But manage she did, and beautifully. For, in an alien city, Mumbai, with alien language and customs, she took to it all like a duck to water, and sailed through with flying colours. In Delhi too, the same happened. You see, she grows younger as I have already said. She gels instantly with persons of all ages. It takes just a few seconds to get anyone talking, with her listening and drawing them out. She never holds back, be it advice sometimes, knocking common sense sometimes, listening, encouraging, consoling. There are very very few people I have come across who can reach out the way she has. In fact even my kids’ gang of friends are her friends; she never holds back; nothing, absolutely nothing! When she knew I was going to be alone, in a few months time, there was no, why don’t you come down here, or shall we come there… just a reminder to be stronger, and have real expectations 🙂 And while we still agree to disagree on a lot of issues, the bonds are stronger than ever. She guides, unhesitatingly, and silently. Waits. Never nags, or asks. It’s cool, either way. She gives us space. Our own, and asks we never trample on hers :D!! Categories: Blog Tradition, celebration, Children, family, Love, Mother, Rambling, Wishes | Tags: Blog Tradition, celebration, cherish, Children, Choices, Daughter, family, Grandmother, Happy Birthday Mummy, Love, Memories, Mother, Rambling, Random things, smile, Wishes | Permalink. Today is special. 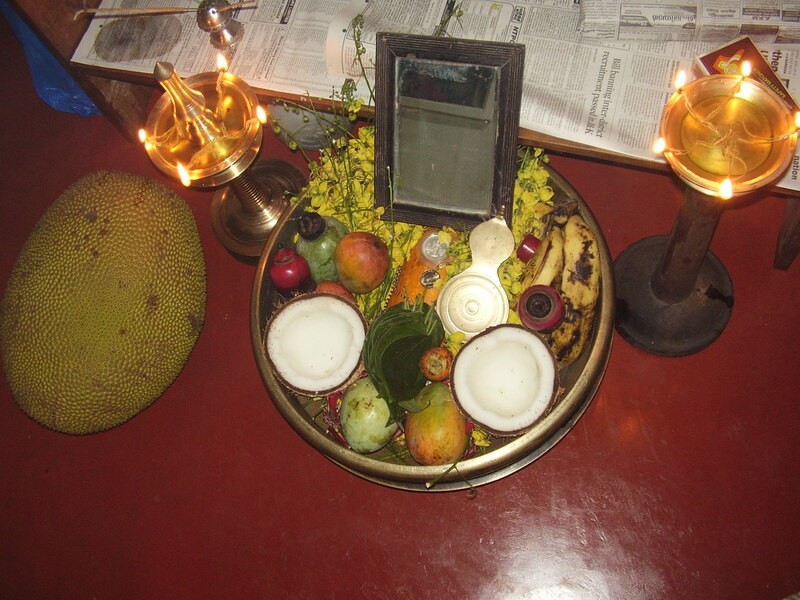 It is Vishu. It is also my EB’s birthday 🙂 (Elder Brother). Happy birthday to another special Arien, and also to a year, reborn again, bringing with it hope for a better tomorrow. 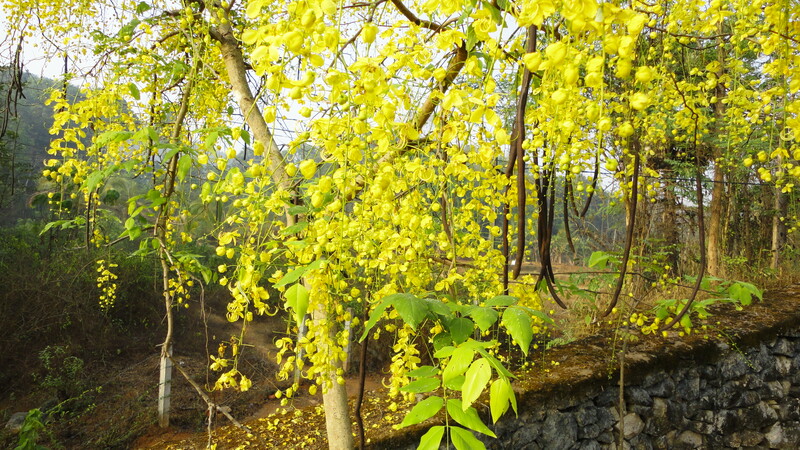 The Kani Konna (- Cassia Fistula, a lot like the laburnum) is the flower of Vishu. Gorgeous chandelier like flowers in the sunshiniest yellow golden, filling the tree, our eyes and our hearts, come Vishu 🙂 It is the key to the Vishu Kani (what you ought to see- kani- the first thing when you open your eyes on Vishu day 🙂 )Here is the tree, at my parents, taken about a week ago… a beautiful sight! 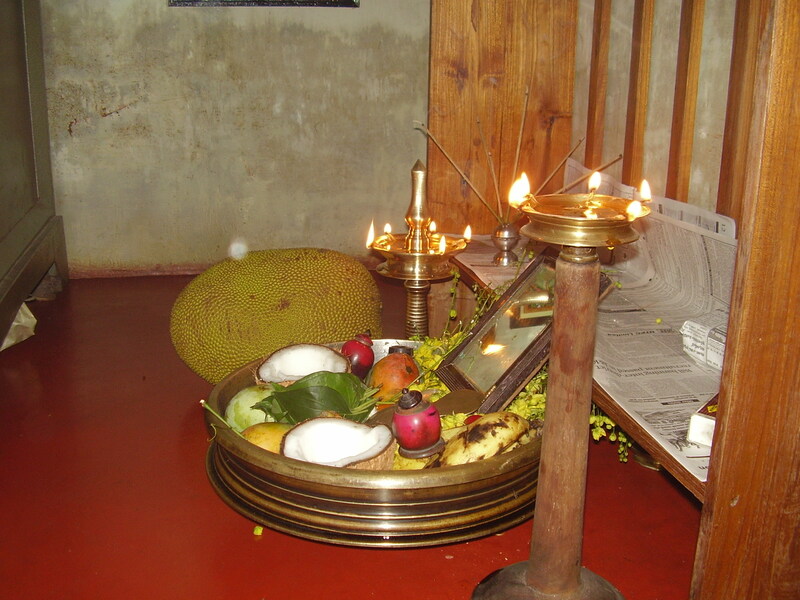 I am also told, that Vishu begins the cycle of rain patterns, the njattuvela (ഞാറ്റുവേല)… 🙂 Today marks the ashwathy njattuvela (അശ്വതി ഞാറ്റുവേല), and it is likely to rain soon 🙂 Each of the 27 stars has its own pattern, with the rohini, makayiryam, thiruvathira, (രോഹിണി, മകീരം, തിരുവാതിര) bringing in the most amount of rain, which is so essential for the farmers. *Whew! Wipes sweat off her brow* This has been satisfying, but hard work. Finding a transliteration page to work with, and finally opening the google transliteration malayalam page, to write there, and copy paste the malayalam here. But it seems to be worth it! Have a wonderful year ahead, everyone! 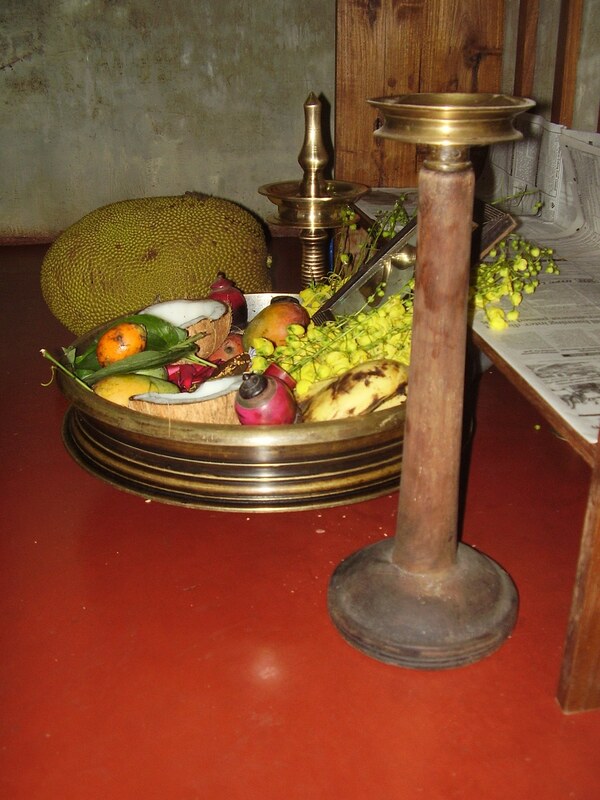 Categories: Blog Tradition, celebration, Children, family, Favourites, Fun, History?, Mother, Rambling, Vishu | Tags: ഞാറ്റുവേല, Blog Tradition, celebration, Children, Culture, family, Favourites, Festival, Fun, History?, Memories, Mother, motherhood, Rambling, Random things, tradition, Vishu, Vishu kani, Vishukani, Wishes | Permalink.